St Boswells has a section for juniors and younger players up to the age of 15. Youth cricket is vital both to the future of the club, and for the wellbeing of the participants themselves, who take a huge amount from being part of a strong local cricket club. The Junior Section is headed by Steven Laidlaw. If you would like to help out in any way then please contact the club at secretary@stboswellscricketclub.org or come along and ask. Training takes place on Tuesday evenings from 6pm until 7pm, starting in early May until the beginning of September. Matches take place between clubs in the Borders throughout the week during the summer. We have excellent facilities and equipment appropriate for all ages from approximately aged 8 upwards. No appointment is required for juniors to take part, just make yourself known to one of the coaches at the beginning of the session. Parents / guardians are encouraged to stay around and enjoy the club facilities, and help where possible, whether that be coaching, setting up / putting away, making refreshments or just providing moral support! If you would like to sign your child up to the Club them please download the junior form here, and hand it to Steven Laidlaw or Katrina O’Neil at the club – Tuesday evening training sessions are best. This information is stored securely and will be used to ensure children are appropriately cared for. Forms are also available at the Tuesday sessions. The club has a Child Protection Officer and Child Protection Policy, and is regulated by Cricket Scotland. 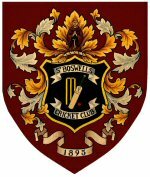 For all your St Boswells CC kit needs, and more, go to our Serious Cricket Web Store. Please support your local club! St Boswells vs Largo report.